Background: Coronary artery disease is one of the most common causes of death in the world. Despite significant advances in the diagnosis and treatment of these diseases, they are still considered a major health problem in the world. The purpose of this report is to provide the clinical experience of Iranian Integrative Medicine, which has the greatest therapeutic effect in the shortest period of time. Case Presentation: A 53-year-old man suddenly experienced persistent chest pain, six hours prior to his visit. This pain increased until his admission to the emergency department. Then, he was diagnosed with acute coronary syndrome and unstable angina. He was transferred to cardiac care, where he was treated for 4 days. The patient received coronary artery angiography at the time and by diagnosis of cardiovascular obstruction, he was chosen as an angioplasty candidate willingly submitting his surgical intervention to another time. The patient was placed under health and nutrition measures after entering the traditional medicine clinic one month after his discharge. Based on his temperament and condition of the disease, drug treatment in this patient included herbs, combined medications and modern cardiac drugs. Hand applications included a complete overhang on the back every night until the end of the healing and leech therapy. Leech therapy was applied on the ankle of the left leg and the forearm of the left arm. After a week, the patient completed the examination and leech therapy was applied on his chest (on the anatomical shadow of the heart). This process was carried out 5 times. The patient underwent angiography for 40 days after treatment, according to his clinical report, and the patient's vascular obstruction improved. The patient's condition was followed for 3 years and no recurrence was observed. 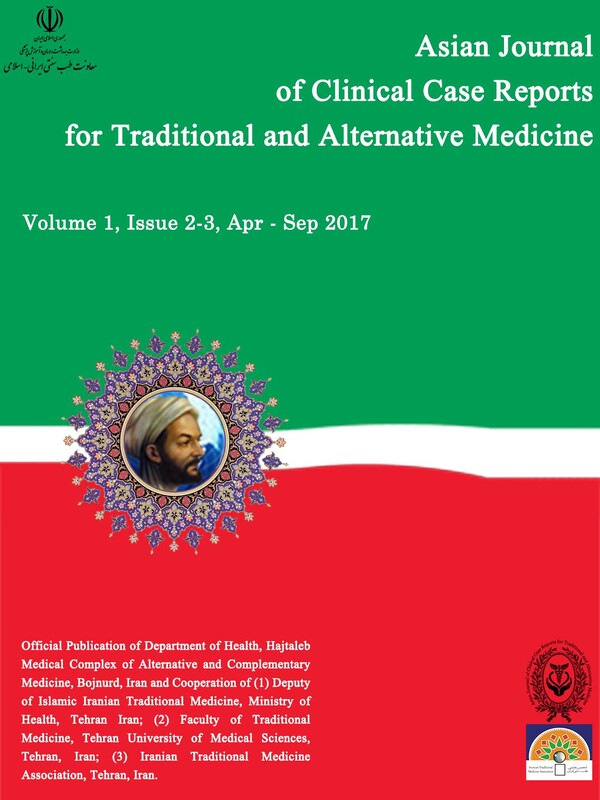 Conclusion: Considering the patient's recovery process regarding physical strength, mental status, and removal of coronary artery bypass grabs, it seems that the combination of modern medicine and traditional medicine in Iran might help the treatment of many common diseases, including coronary heart disease. This necessitates extensive assessments in various diseases based on the teachings of the school of medicine. Coronary artery disease and stroke are the first and second cause of death in various societies  and are estimated to maintain this rating by 2030 . The occurrence of cardiovascular problems varies from country to country and culture to culture. The Middle East and parts of Western Europe are likely to have the highest mortality rates of cardiovascular problems . Cardiac ischemic diseases have been ranked first among the most common causes of death in the Middle East, with the possibility that Iran has the highest incidence of illness in the region . The study of the incidence of stroke in Mashhad estimated 144 per 100,000 for men and 113 per 100,000 for women, which is one of the highest reported rates in the world . On the other hand, previous studies in Iran have shown that 32% of men and 41% of women have at least two main risk factors for cardiovascular disease including diabetes, hypertension, hyperlipidemia, obesity and smoking . However, according to data provided by the United States, more than 6 million people from emergency room referees each year have chest pain of which more than one million are diagnosed with acute myocardial infarction and are admitted in cardiac care units every year. Also, 500,000 deaths annually are due to coronary artery disease . Various therapeutic approaches, including medicine treatments using thrombolytic drugs, anti-thrombics, beta-blockers, calcium antagonists, etc., and invasive treatments like angioplasty and open heart surgery have also been used in the treatment of this disease. In spite of all these measures, these diseases are responsible for nearly half the deaths in industrialized countries  and is one of the most important causes of mortality in Iran . Accordingly, it seems necessary to think of measures to deal with this situation. An important factor in the development of syndromes or different spectra of the disease is inflammation and damage to the wall of the vascular endothelium . Various studies have shown that low-level lipoprotein oxidation plays an important role in the pathogenesis of atherosclerosis. Experimental studies in different experimental animals showed that antioxidants reduce low-level lipoprotein oxidation and decrease the rate of atherosclerotic plaque formation . Generally, epidemiological studies have shown that the increased intake of antioxidants as food or supplementary products is associated with a reduction in the risk of cardiovascular diseases . Despite the dramatic advances in the diagnosis and treatment of these diseases in the last three decades, this group of diseases is still a major health problem in the world and an important problem in developing countries. Today, with scientific advances and developments, coronary angiography is used as an invasive investigation in the diagnosis of known or suspected coronary artery disease. According to the latest data from the American Heart Association in the United States, one million patients are undergoing invasive and diagnostic heart tests. In Iran, about 16 to 18 thousand cases of angiography are performed annually. In most cases, invasive diagnostic tests cause stress and anxiety for the patient. Most hospitalized patients experience some degree of anxiety, one of the most common type happens before coronary angiography . However, it can be said that the increased number of heart disease, increased cases of hospitalization and the high cost of care and treatment challenges put pressure on the health system in the current century. For this reason, the prevention of heart disease complications and their successful treatment is essential because it requires preventive and therapeutic measures such as physical activity, proper diet and the continuation of drug use. This can be done only through active participation of patients in treatment while implementing the recommendations given by team members . There are also many reports declaring that the beneficial effects of effective medicinal herbs as well as traditional and complementary therapies have been observed along with the main treatment of cardiac patients in improving the life quality of patients, which might be used more by the patient while leading to lower costs [20-15]. In this regard, it was necessary to evaluate and make a scientific report based on a combination of modern and traditional Iranian medicine with new methods and medications that have the highest therapeutic effect in the shortest period of time. The patient is a 53-year-old man, with no history of a heart problem, a history of high blood pressure and high blood fat for more than 10 years. The patient is a senior office worker, resident and born in Bojnurd city, weighing about 95 kg with height of about 170 cm. Although the patient suffered from short chest pain for three days, he travelled to Tehran for an official mission. The patient suddenly experienced persistent pain at the back of the chest six hours before his visit. This pain increased until the time of referral to the Emergency department of Tehran's Mehr hospital at 23 o'clock in December 2013. The patient was diagnosed with acute coronary syndrome and transferred to the cardiac care unit for 4 days due to his unstable angina. The main complaint was chest pain along with nausea, vomiting, and cold sweating. The patient received coronary artery angiography at the time and by diagnosis of cardiovascular obstruction, according to Figure 1, was considered as an angioplasty candidate willingly submitting his surgical intervention to another time. After discharge, the patient was treated regarding his blood pressure, blood fat and acute coronary syndrome. One month after being referred to Bojnurd, the patient was referred to the Hajtaleb traditional medicine center based on the advice of a relative. The patient had the following vascular risk factors: 1) smoking 5 cigarettes per day, 2) body mass index of 32/87, in other words, very obese; suffering from hyperlipidemia and hypertension for over 10 years treated with atorvastatin, 40 mg once a day, losartan pill 50 mg twice a day, amlodipine 5 mg once a day, 3) lack of sufficient physical activity, 4) severe occupational stress. During this period, the patient was treated with modern methods. He was anxious and depressed as a result of being hospitalized in cardiac care and undergoing angiography. The patient had a hot and wet temperament, with good physical fitness and no problem regarding clinical symptoms. The patient's pulse was full and felt warmer when touching the skin; the patient did not use proper nutrition for prevention. On the other hand, he did not follow the advice of doctors to abstain and keep hygiene. The patient's sleep status was appropriate, he was in tune with nature and could breathe in natural clean air every month. 1) Use the proper air and walk in nature at least several times a week. 2) The patient was provided with a nutrition guide CD in order to apply all dietary and drinking instructions, and in particular, he was advised to avoid overeating and using fat and red meat but should consume more vegetables and fruits. 3) There were recommendations for sleep and awakening of the patient, in order for him to have a proper sleep. 4) The patient was advised to avoid heavy exercises but should take a short walk during the day. 5) Regarding the fact that the patient should have proper absorption and desorption, it was recommended that he should urinate several times a day while not having excessive sweating. 6) Psychological and stress-free psychotherapy has been applied because these patients need to be relaxed and away from stressful environments. A) Boiled sour tea + rose flower + citrus aurantium + chicory roots: The plants are combined in equal proportions and are half-mashed. Two tablespoons of this proportion is boiled in half a glass of water until half of it evaporates. The rest will be filtered and consumed. It was ordered to use a glass every 8 hours of every day. The four plants above, in addition to the warming and wetting of the blood, have a therapeutic effect on heart disease, especially vascular obstruction. On the other hand, they are anti stress and relaxing. B) After a few days when the patient was drinking boiled sour tea + rose flower + citrus aurantium + chicory roots according to the above instructions, he was recommended to use a combination of rose and senna leaf to repel the damaged material. C) Garlic is one of the herbs used to treat cardiovascular diseases (especially vascular obstruction). The patient was recommended to receive three cloves of garlic daily, which was made with natural vinegar. For men, especially those who are warm in temperament, we cannot prescribe garlic individually, because warm garlic might reverse the effects of the treatment. Cerebrospinal fluid was reported through excessive use of garlic. However, if garlic is used with vinegar, it might have a therapeutic effect. D) Jujube is one of the herbs that is effective in reducing obstruction in addition to dilution of blood, and about 20 jujubes are recommended daily. E) Pomegranate paste is one of the best natural ingredients for warm and wet patients, and is also effective in the treatment of vascular obstruction. Three teaspoonfuls are recommended daily. 1 - Cupping: Full back cupping was recommended every two days because it works to strengthen the body while increasing the blood flow of the patient. On the other hand, it helps to eliminate corrosive edema, and most importantly, it strengthens the immune system. Also, it can even help in forming sputum. 2.1- Leech therapy must be performed by a physician and in a clinic environment equipped with full recovery equipment. 2.2- The medical records of the patient, including the electrocardiogram and echocardiography, must be evaluated by a physician in the field of vision and muscular strength of the patient's heart. In the treatment of heart patients, physicians must have adequate knowledge of the patient's physical strength and heart power, otherwise he / she has no right to treat the patient. 2.3- It is best if the patient is angiographed and the vascular obstruction is confirmed. 2.4- The physician who prescribes leech therapy should have enough information about the patient's physiopathology according to the knowledge of modern medicine and also be familiar with the basics of traditional medicine having been through the full course of scientific leech therapy. 2.5- For the purpose of treatment, the number of leeches, the size of leeches, the number of treatment rooms and the number of leech therapy sessions depends on the physical strength of the patient, the age of the patient, the severity of the vascular obstruction and the patient's temperament. The attending physician should pay attention to all these before starting the leech therapy. Considering the combination of therapeutic methods of modern and traditional Iranian medicine, the patient's general condition improved after the second week, so that the patient's stress and anxiety were not observed or recorded. The patient underwent angiography on February 3, 2014, and all of the patient's vascular obstruction was improved in his clinical report, as shown in Fig. 2. At the moment, the patient was only treated with losartan 25 mg twice a day for his blood pressure and used health and nutritional measures. He also took medication and hand applications periodically over the past three years. The patient's condition was followed for 3 years and no recurrence was observed. On a yearly basis, cardiovascular diseases cause many deaths in the world, such that these diseases are the first cause of death in developed countries . Cardiovascular diseases are multifactorial illnesses and so far many risk factors have been identified. Also, various studies have been carried out on these risk factors at home and abroad. In 1990, the world's population was about 3.5 billion, and cardiovascular disease was responsible for 3.34 million deaths, which equaled 28.4% of the world's 50 million deaths, of which 3.6 million died from coronary artery disease including 44% of deaths due to cardiovascular diseases and 4.4 million deaths from brain strokes which is equal to 31% of deaths from cardiovascular diseases. At the beginning of the 20th century, only 10% of the world's deaths were related to cardiovascular diseases, but it reached 28% by the end of the 20th century, and today it accounts for about half the deaths of developed countries and 25% of the deaths in developing countries. It is predicted that by 2020 these diseases will become the leading cause of mortality in the world with an estimated 36% of the total deaths in the world [7- 2]. Coronary artery inflammation with oxidative stress causes lipid accumulation and, as a result, leads to arterial injury called atheroma. In addition, high levels of lipid in the plasma lead to endothelial activity and increase the adhesion of immune cells to the endothelium, resulting in impaired functioning of the endothelium. The conditional risk factors associated with an increased risk of coronary artery disease include triglyceride, homocysteine, lipoprotein A, coagulation factors and inflammatory markers [12-10]. Despite the significant advances in the diagnosis and treatment of these diseases in the last three decades, morbidity and high cost of treatment of this disease impose a significant burden on the individual and the health system of the community . On the other hand, due to the high prevalence of coronary heart disease in Iran, there is need for more effective and cost lowering treatment methods. Therefore, due to the high cost of long-term treatments and high rates of cardiac complications and physical disabilities, various methods have been used to treat coronary heart disease all over the world, and new therapies are under investigation . The patient studied in this report had ischemic heart disease that was treated with combined therapy. In this report, an attempt was made to use the most effective and least complicated methods in these medical schools to maintain the health and treatment of the patient by combining these schools of medicine presenting a scientific report. In general, there is no specific definition of modern medicine in the description of the traditional medicine for coronary artery disease. But with the knowledge of traditional medicine, these patients can be helped. In other words, if we want to treat ischemic heart disease according to traditional medicine texts, we cannot cure patients. However, a physician who knows the physiopathology of ischemic heart disease, can effectively combine the two schools of medicine (modern medicine and traditional medicine) to treat the disease and its complications. Over the past decade, new solutions have been proposed for the treatment of ischemic heart disease and this has reduced the mortality . With the creativity and innovation, which includes the use of physiopathology of modern medicine, the definitions of traditional medicine in Iran were used in the study of temperament, nutritional reform, strengthening of the patient, radiotherapy, herbal therapy and hand application such as balloon, etc. this is referred to as targeted effective medicine. Therefore, the patient needs therapeutic interventions including behavioral therapy, physical exertion, regeneration, nutrition, herbal medicine, effective Iranian leech therapy (including modern leech therapy and temperament leech therapy) and balloon. Various studies have shown that lifestyle modification toward a healthy lifestyle, including the use of healthy eating, proper nutrition, exercise, non-smoking, and good mental health can provide health indicators even in an individual with ischemic heart disease. It also significantly reduces the risk factors and complications [17-15]. In this study, nutritional recommendations and recommended dietary advice were provided to patients, in order to understand the dietary habits of traditional medicine. Also in this patient, medicinal herbs were added: A) Boiled sour tea + rose flower + citrus aurantium + chicory roots. The four plants above, in addition to their warming and wetting effect (on the blood), have a therapeutic effect in heart disease, especially vascular obstruction. On the other hand, they are anti-stress and sedative. After a few days, the patient was treated with rose and Senna leaves in order to excrete the phlegm. One of the herbs used to treat heart and sweat (especially vascular obstruction) is garlic, and is accepted in all the herbal remedies of the world and the World Health Organization. Jujube is another herb that is effective in the treatment of vascular obstruction besides diluting blood. Pomegranate paste, with its cold and dry temperament, is one of the best natural ingredients for patients with warm and wet temperament. It is also effective for the treatment of vascular obstruction. In choosing therapeutic methods in traditional Iranian medicine, the effective ingredient is important and then temperament must be considered. Namely, we chose plants that are strong in terms of the active ingredient and then adapt to the patient's temperament. In the method of effective medicine, we do not prescribe diligence and judgment in the way that we have been told in traditional medicine, but rather to correct the simple maladaptation. Also, we will use the necessary drugs with the necessary ingredients and, if needed, for treating the material maladaptation. We believe that in most patients, maladaptation is simple. In other words, if simple abnormalities are resolved and medicinal herbs or herbal medicines are administered with the required active ingredient, they will be recovered and there will be no need to examine the patient's temperament. We did the same for this patient. In other words, first we prescribed soda and bile reformer considering their effective substance and then a laxative will be prescribed, the use of which will not be prolonged [18-16]. Generally, herbal therapy in a patient with ischemic heart disease is complex but highly effective, and the placement of these plants is very important in both single or combination forms, which varies from patient to patient. This method of herbal medicine, considering the active ingredient of the plant and the temperament of the patient, is used for the first time in the world. Because temperament is not mentioned in modern books and effective ingredient is not discussed in traditional medicine books, combining these two knowledge is a very complicated process that has been used in many years of research and treatment using the method of effective medicine . Unfortunately, there is no study on leech therapy in Iran. In this patient, we could not take a lot of blood due to his age and weakness of the body. Also, due to his mucoid temperament, it is not permissible for blood to be taken as there is a relative contradiction of leech therapy and blood therapy in traditional medicine. The leech treatment approach in this patient was saliva therapy and did not require blood taking. But because the leech did not take blood, it did not give saliva, therefore, it has to be blooded by leech, keeping the points in mind that a) the amount of drinking for the patient is more and smaller leeches were used B) The period between the two leech therapies was increased so that the patient's body had the opportunity to regenerate itself naturally. In this patient, the leech's saliva was helpful for treatment, of which the effective ingredient has anti-inflammatory, anticoagulant, antiviral, antimicrobial and blood-forming properties that can help with the treatment of ischemic heart disease. In other words, one of the best therapies in traditional medicine for treating vascular obstructions is leech therapy and it is accepted throughout the world. In leech's saliva, there are several anti-coagulant agents that can act as an anticoagulant and reopen and rebuild the cardiovascular system. Among these, heiridine and Colin can be mentioned, both of which are effective in the treatment of vascular obstruction. Heredine in leech's saliva is a substance that prevents blood coagulation, and also the Colin in its saliva keeps the wounds open for 12 hours and stops the activity of the Will Brunt factor. Hyaluronidase acts as a proliferator factor. This factor facilitates the removal of Mucopolysaccharides, and can serve as a route for subsequent biochemical materials. The salivary carboxy peptidase in leech's salvia is a kind of histamine-like inhibitor that expands the capillaries around the leech bite, thereby increasing the flow of blood at the site of fecundity. In short, heroin inhibits blood coagulation by joining thrombin, and quinine prevents blood coagulation by preventing the Van Will Brund factor from joining collagen [19-20]. In conclusion, with regard to the course of medicine, during the last century, one cannot say that there is no complete school in the world of medicine. Therefore, medical schools such as modern medicine, traditional medicine of Iran, Ayurveda in India, Chinese Medicine, etc. which are all into human health preservation, have many weaknesses and strengths because they are incomplete and incomprehensive. Effective medicine as a combined school of two knowledge in two modern medicine and traditional Iranian medicine schools, provide effective clinical findings in the treatment of certain diseases, such as ischemic heart disease. Therefore, in the treatment of this disease, the use of effective medicine methods will cost less and improve the quality of life of patients. Therefore, according to the principles of modern medicine and traditional medicine in Iran, it can be investigated and evaluated as a non-invasive new therapeutic method with the highest therapeutic effect in the shortest time. This article is the outcome of treatment measures by Dr. Hassan Hajtalebi. Dr. Hassan Khani and Hamid Hajtalebi cooperated in documenting and writing the article. The authors of this paper appreciate the patients and her families’ cooperation in participating and completing all treatment and healthcare processes. The authors also thank the nurses at Hajtaleb Medical Complex of Alternative and Complementary Medicine for helping to treat the patients. Motlagh B, O'Donnell M, Yusuf S. Prevalence of cardiovascular risk factors in the Middle East: a systematic review. Eur J Cardiovasc Prev Rehabil 2009;16(3):268-80. Gaziano TA, Bitton A, Anand S, Abrahams-Gessel S, Murphy A. Growing epidemic of coronary heart disease in low- and middle-income countries. Curr Probl Cardiol 2010;35(2):72-115. Azarpazhooh MR, Etemadi MM, Donnan GA, Mokhber N, Majdi MR, Ghayour-Mobarhan M, et al. Excessive incidence of stroke in Iran: evidence from the Mashhad Stroke Incidence Study (MSIS), a population-based study of stroke in the Middle East. Stroke 2010;41(1):e3-e10. Sarrafzadegan N, Baghaei A, Sadri G, Kelishadi R, Malekafzali H, Boshtam M, et al. Isfahan healthy heart program: Evaluation of comprehensive, community-based interventions for non-communicable disease prevention. Prevention and Control 2006;2(2):73-84. Beagleho L. Cardiovascular disease in developing countries. BMJ. 1992;86(3):1008-9. Saraf Zadegan N, Boshtan M, Maledfzali H. Seulatrends of mortality from cardiovascular disease in Iran: With special reference to Isfahan. Acta Cardio. 1999;54(6):327-3. Eric B. Rimm, Meir J.Stamper. Antioxidants for vascular disease. Medical clinic of north American 2000; 84(1): 239-49. Kazumi-T;Yshino-G:Antioxidant and cardiovascular disease, Nippon-Rinsho 1999; 57(12): 2837-41. Harkness K1, Morrow L, Smith K, Kiczula M, Arthur HM. The effect of early education on patient anxiety while waiting for elective cardiac catheterization. Eur J Cardiovasc Nurs. 2003; 2(2):113-21.
infarction: concepts and controversies. J Am Coll Cardiol. 1990; 16: 223-31. Hossein, Mir-Heidar. Plant sciences. Sixth edition. Islamic Culture Publication Office. Tehran. 2006. Emami, Ahmad; Fasihi, Shirin; Mehregan, Iraj. Reference book on medicinal plants. Institute of Medical History Studies, Islamic and Complementary Medicine at Iran University of Medical Sciences. Tehran, 2010. Avicenna. Translated by Abdolrahman Sharafkandi. The Canon of Medicine. Fourth edition. Soroush Publications. Tehran. 1989. Andreas Michalsen, Manfred Roth, Gustav Dobos. Medicinal Leech Therapy. New York, Georg Thieme Verlag, 2007.